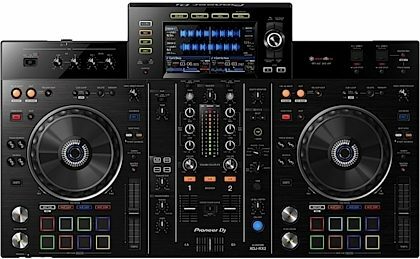 Pioneer has changed the game yet again with their XDJ-RX2 Professional DJ system. This standalone unit does away with both CDs and laptops, instead opting for playback and recording through USB drives, music management through rekordbox, and visual display/interaction through a 7" LCD touch screen. And since it's designed with a look and sound similar to the renowned "Nexus" line of mixers, the XDJ-RX2 still offers all that Pioneer users have come to expect in intuitive controls, quality effects, and smooth EQs. Pioneer has upgraded their popular all-in-one DJ system, the XDJ-RX, to create the XDJ-RX2. Save booth space and money with the all-in-one XDJ-RX2! Instead of bringing along stacks of CDs or plugging in to a laptop, you can play tracks off your first USB drive while recording your live set straight to the second one. You can do all your track management in the included rekordbox app. Set cue points and prepare tracks all well in advance from your mobile device -- then when it's gig time, you can focus on the crowd. Want to stick with your laptop rig? No problem. You can run rekordbox software on your laptop, and use the XDJ-RX2 as a USB controller. If you've ever rocked CDJs or a DDJ controller, the XDJ-RX2's jog wheels and cue buttons will feel just like home, with all the smooth control you're used to. And if you've already invested in turntables you love, the XDJ-RX2 can be used as a standalone mixer! If you liked the original XDJ-RX, then you're going to love the RX2. With way more inputs and double the number of performance pads, the RX2 is a professional DJ solution with flexible routing and triggering of cues and effects. And with the addition of touch screen functionality, features like Needle Search and Wave Zoom make surgical control of your DJ sets easier than ever. It's the same touchscreen as the ones found on Pioneer's top CDJ decks. Taking a page from Pioneer's flagship Nexus line, the XDJ-RX2 features industry-standard effects and smooth, musical-sounding EQ curves. It also comes with a free license for rekordbox DJ software as well as support for rekordbox video. zZounds is an authorized dealer of Pioneer products. 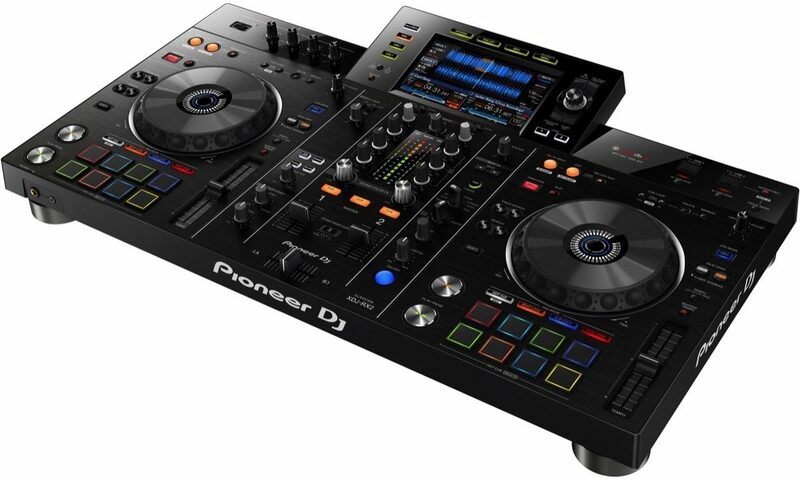 Pioneer DJ has upgraded their popular all-in-one DJ system, the XDJ-RX, to create the XDJ-RX2. This two-deck, two-channel system inherits features and design traits from Pioneer's flagship NXS2 set-up to bring you a professional DJ experience, whether you use it to control music stored on your laptop via rekordbox dj, or directly from USB devices. The 7-inch touch screen in the centre of the XDJ-RX2 displays waveforms from both decks simultaneously, plus detailed track information including sync status and playback position so you can get a quick visual reference during mixes. You can bring up a QWERTY keyboard on the display to find your next track faster, plus there's a large rotary selector and Needle Search, Track Filter and Short Cut features inherited from the flagship CDJ-2000NXS2 multi player. Each deck has eight large, multicolored Performance Pads for tactile control over Hot Cues, Beat Loop, Slip Loop and Beat Jump, and you can get even more creative with the Beat FX and Sound Color FX, which come from the flagship DJM-900NXS2 mixer. The XDJ-RX2 comes bundled with a licence key for Pioneer's professional DJ performance application, rekordbox dj. Simply activate the license key, connect your PC/Mac to the XDJ-RX2 via a single USB cable and start using the system to trigger features and FX in the software. A limited number of the XDJ-RX2 systems we ship will also include a license key for rekordbox video -- the Plus Pack that enables you to bring videos into your performances when you play with rekordbox dj. Stay in control of your performances at all times with help from the 7-inch touch screen in the centre of the XDJ-RX2. Keep an eye on waveforms and detailed track information, including sync status, from both decks at the same time to ensure seamless mixing. Use Wave Zoom for a closer look at the current playback position and call up a QWERTY keyboard to quickly find the next track you want to play. You can also browse through tracks using the large rotary selector and Needle Search, Track Filter and Short Cut features, all of which come from the top-flight CDJ-2000NXS2 multiplayer. Perform precise, smooth mixes on the XDJ-RX2 using the EQs and channel faders, which feature curves equivalent to those on the DJM-900NXS2 mixer. Add creative flair with Sound Color FX and Beat FX, also inherited from the flagship mixer. Unleash your creativity with eight large, multicolored Performance Pads on each deck for instant access to Hot Cues, Beat Jump, Beat Loop and Slip Loop, all of which are popular professional features. You can set up to eight Hot Cues on each deck. Import tracks to our rekordbox music management application on your PC/Mac to prepare them for performances by analyzing BPM and setting up Hot Cues and loops. Using USB connection/Link Export mode, you can connect your laptop to the XDJ-RX2 and play your prepared tracks via the system without needing to export them to a USB device. Every XDJ-RX2 comes bundled with a license key for our professional DJ performance application, rekordbox dj, worth $129.00. Thanks to its built-in sound card, you can connect the XDJ-RX2 to your PC/Mac with a single USB cable and use it to control the software. Overall: This is an amazing all-in-one unit! I recently DJ’d an entire event with nothing more than this unit and a flash drive. Highly recommend!